The WATSAN Walk for Water is one of our key fundraising opportunities. Every two years a large group of supporters gather for a weekend and take part in a sponsored 20+-mile walk to raise vital funds for the projects in Uganda. The previous four walks have raised a total of some £60,000, and made important contributions towards our projects. In 2019 we are looking to support a project at Kihihi Hill, close to the Rift Valley where a serious drought made life very difficult in 2016. We now have a date for our 2019 Walk for Water, which will take place on 22nd June 2019 in the Quantock Hills, Somerset! We are delighted to invite our supporters and interested family and friends to join us in Somerset for the 2019 Walk for Water on the weekend of 21st to 23rd June 2019, based this time at Great Wood Camp, west of Bridgwater. The Quantock Hills are an area of wilderness and outstanding natural beauty with heathland summits, deep wooded combes, undulating farmland and attractive villages. We very much hope you will join us at between 4.30 and 6.45pm on the Friday evening in order to meet fellow walkers and supporters over supper from 7pm, and to be ready for an 8am start on the Saturday morning. The walk is 20 miles long and is done in one day. After dinner on Saturday those who are able are encouraged to stay over until Sunday morning, rather than take to the roads after a strenuous day. On Sunday morning after breakfast there will be a short service of thanksgiving and prayer for WATSAN for all who would like to join us. For the walk itself, we leave Great Wood Camp on Saturday morning, heading south-westwards for Hawkridge Reservoir, passing the Gothic revival mansion of Quantock Lodge, to arrive at our first stop at the village hall in Merridge for refreshments. The shorter walk starts here. The route then takes us over Cothelstone Hill (332 m.), and along the West Macmillan Way, descending for picnic lunch in the beautiful grounds of the National Trust’s Fyne Court. We return past Ruborough iron age hill fort and over Wind Down to Merridge for tea. After tea the long walkers climb back to the West Macmillan way, passing over the highest point at Will’s Neck (384 m.) and St. David’s Well, and down through Great Wood and back to the camp in time for a celebratory dinner. There will be opportunities to walk lesser distances of five or ten miles only, if you should so decide. We have space for 70 people at Great Wood, so please contact us if you would like to take part in a this walk. We are delighted too that the concept is spreading! In China a “Walk for Water” organised by Rebecca Twitchin at a school has raised several thousand pounds for WATSAN. On 23rd. 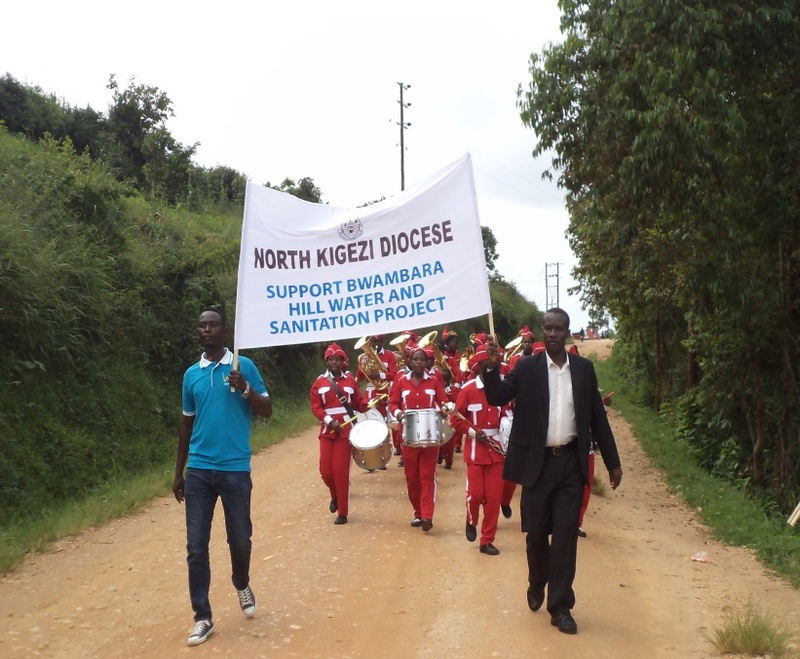 May 2018, our partners in Uganda, NKKD WATSAN, organised a “Walk for Water” in Bwambara for the current Bwambara Hill project. Using different approaches such as Radio talk shows, appeals to local beneficiary communities, and to a wider audience across Rukungiri District and beyond, a total of 20.3 million Ug/= (about £4300) plus 11 bags of cement was raised. We are delighted with this result, as well as the contribution from China, both of which assisted the Bwambara Hill to be undertaken during 2018.